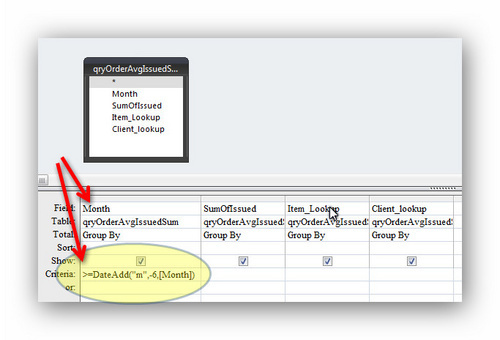 How do one filter on a "month field" ie 12/2013 format when mmddyyyy is not available in a query. I need to view only the last 6 month records. And add a where clause as you indicated ie. Also you may need -7 month to return the requied data? Your question is not very clear. What is available in the query? Are you saying the query does not have a date field but only a MMYYYY field, (probably in an integer)? If that is the case you could rearrange it to be YYYYMM and compare it to (Year(Date()))*100)+Month(Date(). Jim, i filtered the query to not display dd/mm/yyyy but ONLY MM/YYYY . I need to display the last 6 months data in this query now. I cannot filter on dd/mm/yyyy as i merged two different dates into one mm/yyyy field, based on criteria that must now be filtered. "How do one filter on a "month field" ie 12/2013 format when mmddyyyy is not available in a query." I can't work out what you're trying to say. It doesn't make sense as it stands and I have no idea what you mean. I'm afraid they don't Neels. Is there any reason you cannot express your question in words that make sense together? In your initial post, you might need to make sure the formats that are comparing the 2 dates are the same. Edit: NeoPa is correct. Date() does return a Date/Time value. You might want to try a Format() on the Date() to match your criterion. You are trying to compare that to a custom mask MM/YYYY. Hope this helps. NeoPa : I was not trying to mislead the OP, however convey to him that the format is different. You are indeed correct. I should have told him what you mentioned. Thanks for the correction. "Date() returns a short date." I'm sorry - that's just wrong. Date() returns a Date/Time value - not any type of string. How it's formatted when displayed is not what it is, but simply how it's formatted. It may well be that trying to do a comparison using SQL and getting the formats wrong (so they don't match) is what's getting Neels confused. I'll have to wait until his question makes sense before I can help further. Allen Browne form filter top n records? How to reterive the last 5 records in a table?